The price for the meat-centered diets, as well as other land-eating and land-destroying human practices, often promoted by interested lobbies, is paid by the wildlife – fauna and flora – of our planet. Huge tracts of natural land, forest and woodland worldwide are “cleared”, in the main for cow grazing. This results in irreversible soil degradation, habitat destruction, loss of biodiversity and species extinction. It will eventually, and not too long in the future, also result in economic collapse. The effects are already noticeable on the global climate, as well as on our physical and spiritual well-being. There are currently 7.7 billion humans on the Planet, but historically, even very small numbers of people have caused irreversible ecological damage to delicate ecosystems, as well as extinction of some of the largest animals to have ever walked the earth. Irreversible translates into – soil becoming unfit for forest growth or agriculture due to salinization or other factors, soil eroded leaving bare rock behind, coasts receding (see pic above), good soil turning into mud/sand/peat, climate change caused by deforestation resulting in desertification, islands and lowlands submerged due to rising sea levels, lakes drying, plant and animal species going extinct, temperatures rising (or sinking) beyond our physical tolerance, etc. From other Beings’ point of view, irreversible might mean critical loss of habitat or living resources, ecological imbalance of prey/predator, over-hunting/fishing etc. These will often result in species extinction. At a minimum, it might mean a change of location or acquisition of new habits, often not those people like. Many wild animals, for example, now hunt for food in the hearts of cities. From the Planetary “point of view” none of this matters – the bacteria deep in the soil or in the hydrothermal vents will suvive any onslaught, including a nuclear disaster and permanent darkness. The planet still has a billion years or so for restarting multicellular evolution before physical conditions will become prohibitive for anything resembling Life. Chances for another grand experiment in highly conscious beings is probably unlikely, though, in that time stretch. Some changes could be reversed given a long enough time, but this is usually too slow, too late. Lakes that dry out can be refilled in geological time, but some changes, like species extinction, are irremediable. Soil can be recreated, but that is a very very long process. As we, humanity, with our unprecedented success as a species, have brought planetary resources to the edge, it can be instructive to keep some historical and pre-historical examples in mind. Here I’ll elaborate about what I see as the ecological disaster of the northern islands of the UK, Ireland and Iceland. In the next post I’ll talk about Australia – the biggest island of all. I’ve traveled the various British Isles (Hebrides – Inner and Outer, Shetlands, Orkneys) as well as Ireland (North, Republic), mainland Scotland, England, Wales. I’ve been over there several times and for good periods of time each – walking the land, feeling the place. These are beautiful countries, especially thanks to the ever-present presence of the sea, but there is a dock of sadness hovering over it all, sweet yet melancholy. I’m not going to talk here about London’s urban sprawl, or the tragedy of bygone industrial and mining cities strewn around. I’ll concentrate, instead, on the forlorn and destroyed countryside, traditionally romanticized and glamorized in literature, poetry and the national psyche. Two issues stood out for me in all of my trips to these lands (5 or 6 in total). One, so much of the land is treeless. Two, too much of the land is sheep-ful. Sheep Obsession and the North Atlantic Islands - Irreversible Ecological Damage? I never understood the sheep phenomenon. Why so many sheep? What for? Who is using that much wool nowadays, anyway? If that is what they all eat, why do I mostly see chicken and beef in the restaurants? Who is really “in control” here? Have the sheep actually domesticated the people here, in the spirit of Harari’s smart analysis of how wheat domesticating humans? Perhaps humans let the sheep run the entire land because they are soft, white and fluffy, like the uniform cutsie white lace curtains over all the windows? And is that all there is to the legendary English “countryside”? Meet the greatest threat to our countryside: sheep! Apparently the British public even subsidises these creatures for reasons he describes as an “obsession” and fear of the “hill people”. In reality, in his words, the animals are worth next to nothing: the government describes the economic value of the grazing as ‘negligible’. “We pay billions to service a national obsession with sheep, in return for which the woolly maggots kindly trash the countryside“. The grazing and stamping cause serious erosion, creating intermittent flooding and drying of the lowlands as well as mudslides. And the countryside is dead: “Only the merest remnants of life persist. The land has been sheepwrecked”. Monbiot states further that there’s more life diversity in an English urban garden than in the wide countryside. Despite all that, for some peculiar British reasons, calling the sheep destructive is considered blasphemy. Almost everywhere I looked in the British Isles and Ireland, the sheep (and cows) created a uniform, boring, monotonous, homogenous and lifeless landscape (sorry for the multiplicity of adjectives, couldn’t help it). The only place where biodiversity persists and is protected other than in gardens is in the famous hedges. Otherwise, most of the glamorized countryside is basically a green wasteland. Treeless Orkney landscape with sea and grass. And it gets worse, the more north you go. Walking around the treeless Scottish Shetland isles, sheep will be found on the remotest hanging cliffs… No nook nor cranny spared. It is neither the wind, nor the cold or the lattitude, although all these contribute to making the environment more fragile. Archaeological investigations using pollen studies have revealed that the Shetland Islands had once had an extensive tree and shrub cover. The real reasons for the lack of trees today are the clearances for firewood and pasture, which have prevented natural regeneration. In some places where sheep stop treading, trees can still grow. But more commonly, where waterlogged conditions have already formed, they created anoxic bogs with Sphagnum moss, that eventually turn to peat. Currently blanket peat covers half of the islands area. As I’ve seen in Campobello Island, Canada, these bogs are so nutrient-poor, plants need to turn to a carnivorous (heterotrophic) mode to survive. I reland is another disaster zone, though undoubtedly, in that heartfelt way, a very beautiful one… Much of the soil had turned irreversibly into peat after ancient and modern peoples deforested the island, mostly for pasture. By 4000BC, Ireland was thickly forested across almost all of its surface. By now, a sixth of the country is covered in bog, and only 11.1% is forested, the lowest in Europe. Above is me, walking the hills of Connemara, Ireland, in 2003. This is a scan of the paper picture. Quality accordingly…Apologies, but I thought it really conveyed well the spirit of the place. Even before the Great Famine, caused by a nasty combination of ecological and political factors, the poor land, denuded, eroded and bogged, could not carry the growing population. Emigration had already been “a feature of Irish history more than almost any other country in the world”. Today, apart from the 5 million people actually living in Ireland, there are an estimated 55 million people worldwide with Irish ancestry. Ecological migration? Potatoes, a translocated American crop, took easy hold in the poor Irish soils. Originally, the potato was excellent. With added milk, it provided enough protein, carbohydrates, energy and minerals to lead a balanced and healthy diet. But by 1840, farmers in wetern Ireland were eating three potato meals a day, and dairy was hard to come by. Furthermore, the two early varieties, the Cup potato and the Apple potato, were driven out by a more successful single breed, the Lumper Potato. It required little manure and could tolerate poorer soils. When farmers discovered that this brand of potatoes could grow double the amount of food in the same area, they dropped everything else. That monoculture is what set the stage for the blight disaster. About a million people died of hunger and diseases, and two more million emigrated. This catastrophe is aptly called “The Irish Holocaust”, since the handling of the situation by the British government clearly aggravated the nutritional disaster. The monoculture corn cultivation in vast regions of America could similarly be at risk by unforeseen calamities (See what I wrote about the Corn system). And, indeed, a drought in 2012 destroyed 27% of corn, soybean and other crop yields in the U.S., affecting millions of people around the world. Obviously, America has much more to fall back on in case of a crop pandemic, but it can still be devastating. The more degraded a land is, the more it is prone to the effects of accidental or unpredicted calamities. Award-winning “Angela’s Ashes” by author Frank McCourt depicts a picture of appaling poverty in Ireland in the 1930s and 40s. Wikipedia states that The Great Depression has struck Ireland, particularly Limerick where his family lived, even harder than it did the United States. Even if a “crop” is oil, depending on one single source of income can be dangerous, as can be seen to an extent in Venezuela. And there are always the human-made complicating factors, like the British mismanagement of Ireland, or the socialist government misanagement of Venezuela. Further North Still - Iceland. A Case of Irreversible Ecological Damage? “Within a short time after settlement, Iceland’s soils began to be carried from the highlands down to the lowlands and out to sea. The highlands became stripped of soil as well as of vegetation, the former grasslands of Iceland’s interior became the man-made (or sheep-made) desert that one sees today” (p.201). In Iceland’s particular case, once the grass was destroyed, the original volcanic ash beneath was exposed and became easily wind-borne and water-borne. Additionally, the local walrus community was decimated by over-hunting, sending the Viking hunters to further grounds still – Greenland, another interesting story I will not get into here. By now the island is doing very well economically, but it depends almost entirely on other sources – tourism, fisheries, some mining and finances. Most rural people had by now moved to cities. Light at the end of the deforestation tunnel? Let’s hope it’s doable on a meaningful scale. Every tree counts. I’ve taken the experiential visitor week at Findhorn community and eco-village in 1987. After about a month of traveling in mainstream grey England and Scotland, the first colorful organic vegetarian meal in the communal dining room was like a visit to Paradise. 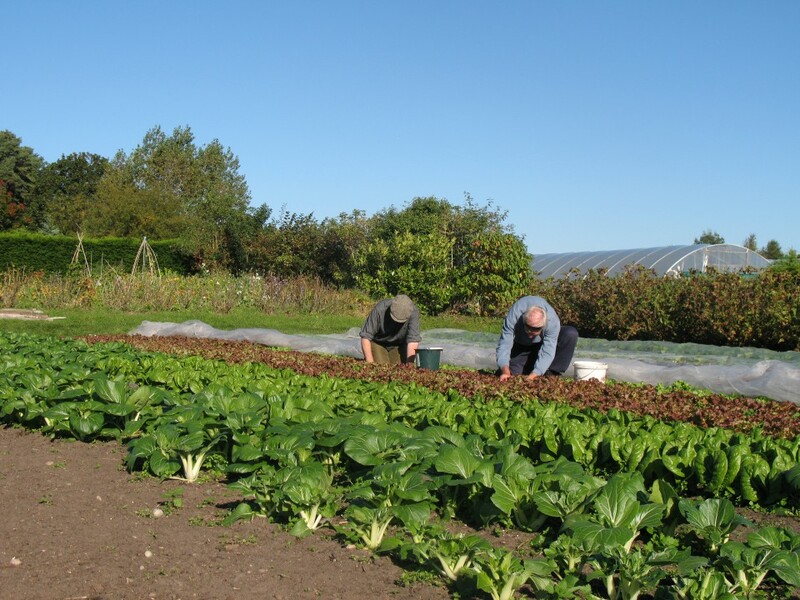 Cooks and gardeners in Findhorn make it their spiritual path to do their work in love. The community, located in northeast Scotland at 57.66 lattitude is purely vegetarian, organic and upholds high spiritual values of work, camaraderie and connection to Nature. I had a marvellous experience on every possible level – gastronomic, social, spiritual. The work in the gardens and kitchen was very rewarding and enjoyable. I liked the international company. It was a lift to another level of existence. As much as I loved Findhorn, I recognize it is not a model to follow for everybody. Lamentably perhaps, idealistic communities are not becoming a widespread form of life in the modern world. Findhorn Foundation, in particular, has a strong international orientation, and therefore might not “speak” to many in local communities. Therefore, I want to stress that it is not essential to follow Findhorn’s spiritual path, their exact ecological model or their lifestyle in order to save the British countryside. Humans often operate better with a spiritual creed informing their actions, but it is not a requisite. Working in a community and enjoying the camaraderie and shared goals can be a great way of life for some, but perhaps too big of a leap for the average traditional farmer. There is no need to change from, let’s say, a family-and-church-centered lifestyle or even from a solitary, secular way of life, to a New Age communal style, in order to live in a more wholesome way in the land, on it, off it and with it. 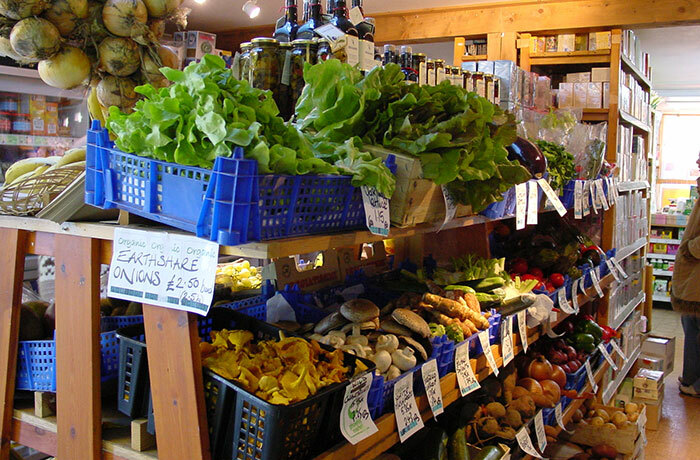 However, much can be learned from Findhorn on living sustainably on the harsh Scottish land. In 2014, Morgaine, another visitor to Findhorn, participated in the same experiential one-week program I did 27 years earlier. She wrote a beautiful article about the community and her experience. As for me, my memory is a bit dim, and I cannot find the few pictures I took at the time. So, alas! Make the UK and Irish Countryside Great Again! To me, what is really important is to remedy the land, stop the erosion and degradation, reverse detrimental processes to the extent that we still can, and start doing it as soon as yesterday. A sheep grower can begin diversifying his or her economy by building a greenhouse, planting a vegetable garden, fencing off a section of his lot for reforestation. Gradually s/he can scale down on the devastating grazing and rejuvenate their piece of God’s Land. Findhorn is a proof that it can be done, even in poor soils, even in sand, even very high up north. Israeli agriculture in extreme desert is another proof of the human ability to find ecologically-sound solutions in another challenging eco-system. Even urban people, uninterested in either agriculture or communities, can help by simply switching to a predominantly plant-based diet, consuming a limited amount of animal products and supporting environmentally-conscious producers by buying their products. Trees have it rough and slow in northern harsh climates, but they can make it if “allowed”. I’ve seen amazing trees on my trip to Northeast America . See my post,”Last Stand“, on fir waves and other tree adaptations in the Adirondacks, photos of unique tree “tricks” in New Hampshire’s “Lost River” reserve, the enduring dwarved trees in Newfoundland’s Tablelands and the delicate line between bog and forest in Campobello Roosevelt Park, Canada. A tree on “crutches”. Acadia National Park, by Jordan Pond. In the extreme landscape of the Tablelands, Newfoundland, not only is the climate harsh, but the soils are nutrient-depleted due to their geological origin. Trees are dwarved, close to the ground and slow-growing. Soil formation is slow and precarious in many northern environemnts. See the pic below and my post with a sliding photo show on rock colonisation in Isle La Motte, Vermont, as a good example. In such ecosystems,careless human interruption can have rapid devastating effects, often bringing about irreversible ecological damage. On the other hand,the amazing resilience and ingenuity of northern trees gives some food for hope! Something called me to take a look at a country I haven’t been to – Australia. Maybe it was Noah Yuval Harari’s book with his claim that the aborigines had already decimated the original mega-fauna of the Continent. Maybe it was something else – the size, the scope, the endangered unique fauna and flora, the drastic and rapid effects of the European conquest on everything Australian, and the potential for some kind of redemption. The recent fires, floods and heatwaveswere another instigator, or premonition of the dangers of the “What if we do nothing??? Diet and environment are tightly linked. Vegetarian environmentalism had been around for at least 50 years, but takes a while to take root. Cutting down on meat consumption can prevent deforestation and ecological disasters that affect us all, from Ecuador to the British Isles.